Small bathrooms need not necessarily look cluttered up and boring when you follow these amazing 20 tips that will help you maximize space in your small bathing chamber. With simple tips or ideas presented below, we are sure that you will save ample space in your bath area and lend it a bigger look, a look that is fresh and lively! Do check out below and get some cool ideas! 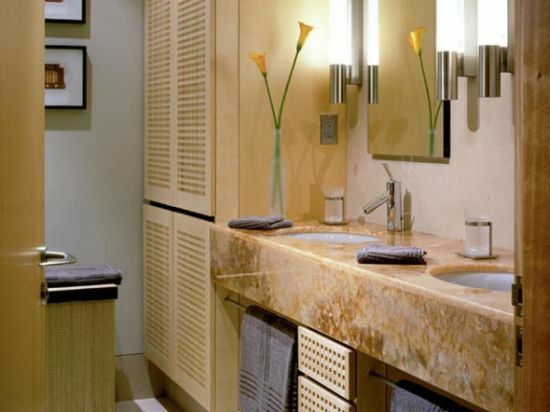 For a small bathroom, you must use lighting over the vanity area to illuminate the room properly. There are a number of light fixtures you can choose for this purpose. Here the bathroom has been lit up with a number of spot light fixtures installed over the vanity and on the ceiling, thereby, illuminating the whole area and making it look bigger. If your bathroom is small, there is a very innovative way to add in more space to its look by installing a furniture style vanity as seen below. The dark wooden facade with a sunken white sink adds to the beauty and makes the vanity look very elegant and enhances the decor of the bathing area. To allow the illusion of a bigger space in your small bathrooms, you have to do away with enclosed bathing chambers and instead install glass shower enclosures. Glass enclosures create bigger space where you can see the whole length and breadth of your bathing room clearly. 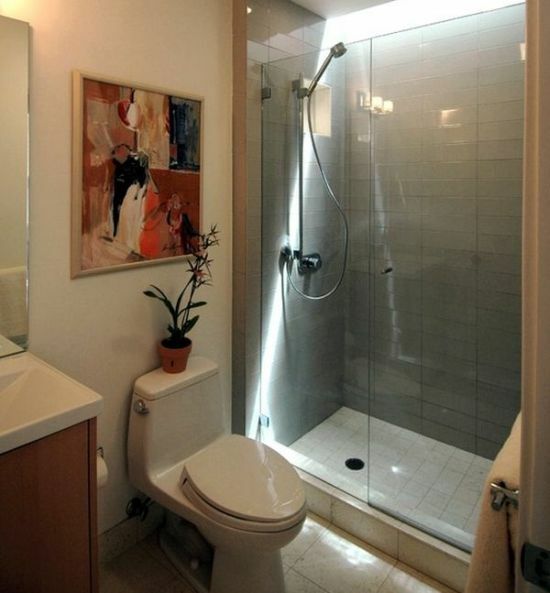 The glass shower enclosure seen below adds a feel of spaciousness to this small bathroom. 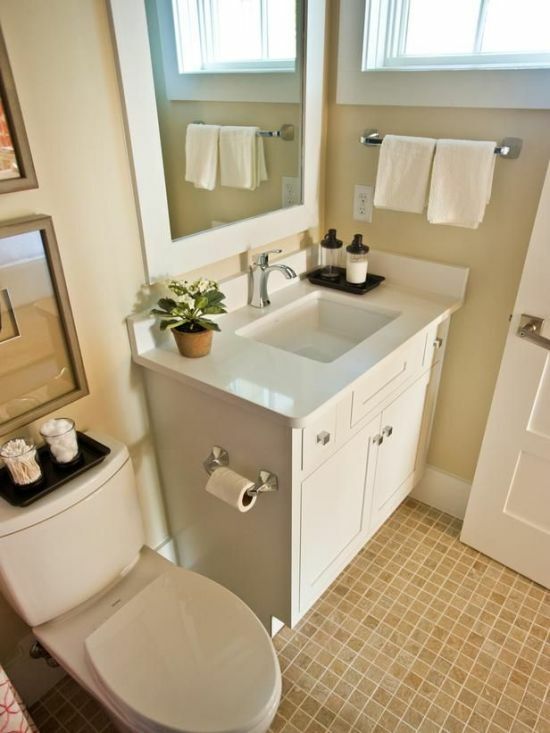 Choosing small fixtures in your bathrooms will help create a bigger look. Seen here in the image is a refreshing small bath area where the fixtures like the sink, tub, shower, tapes, medicine and storage cabinets are small sized and scaled down to save space. The wall has inbuilt shelves to solve storage problems. Small bathroom ideas with towel holders attached behind the door of a bathroom solve space issues and help to lend a bigger feel to it. Seen below is a small bathing room where the door has been fitted with towel rods or stands to save on space. The bathroom looks not just bigger but clean as well. 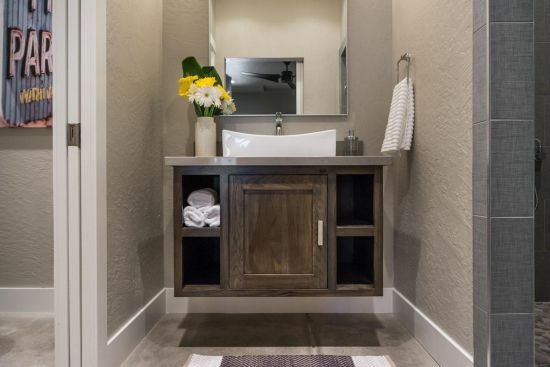 In the image below, the bathroom has been installed with a floating vanity with a pocket door that offers storage for linen and towels, thereby, adding more style and spaciousness to the room. The floating vanity also frees up the floor area and looks pleasing. Small bathroom designs often come equipped with cool storage solutions and the one feature that will help you maximize your bathing area’s space is a cabinet such as the one seen below in white. Cabinets like this can be used to store tote or wicker baskets for storing all kinds of bathroom linen and other related items. The tote baskets seen below offer a uniform look to the bathroom and make it appear well maintained as well. 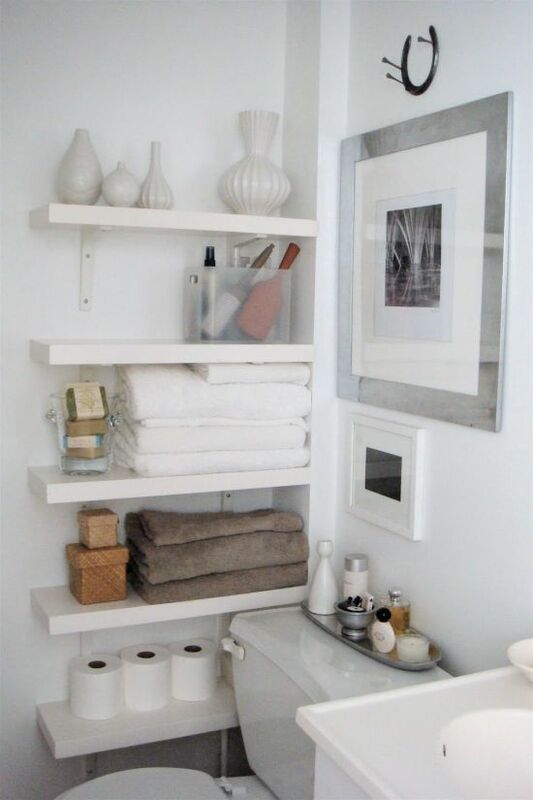 Shelves like the ones seen here save lot of space by allowing storage of many bathroom accessories at one place. The white units seen below are used to keep plenty of things like towels, paper rolls, decorative pieces and many more things that are of everyday use. The look of these units is uniform and blends well with the decor, making the bath area appear fresh and clutter free. 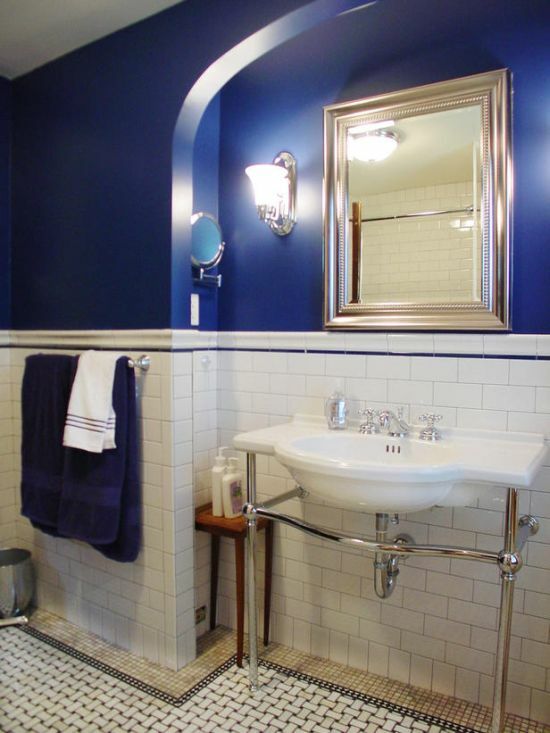 Blue is the bold way to go when redefining the look of your small bathroom! 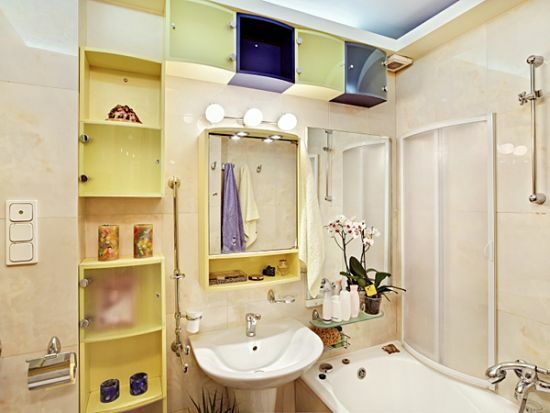 Yes, the bathroom’s walls as seen below, look fresh and very lively with a bold blue tone of paint. The contrast offered by white makes the blue stand out beautifully and makes the room look glamorous. 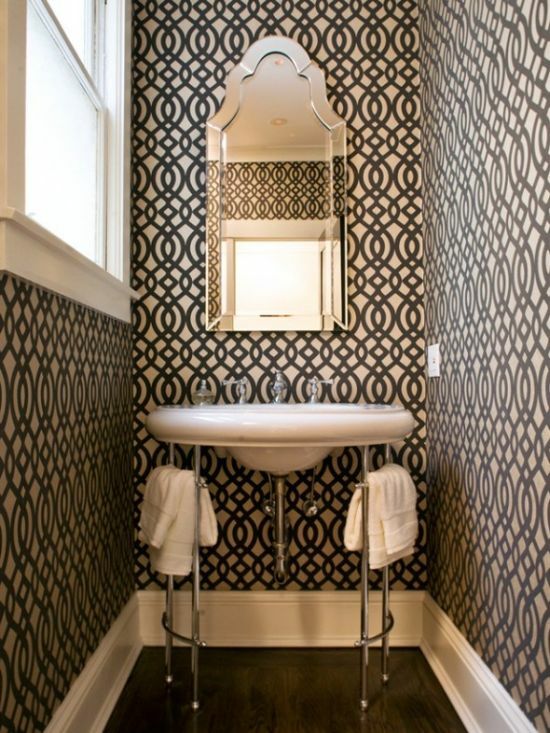 Many small bathroom designs make use of bold patterns to create a spacious look. To bathe in style, you have to remove any kind of clutter. That is why, you must not keep many things on your countertop and instead, place some decorative pieces like vases with fresh flowers to add freshness inside. The image below shows a small bathing area where the countertop is kept free of any clutter, with only a vase and two glasses of water seen. 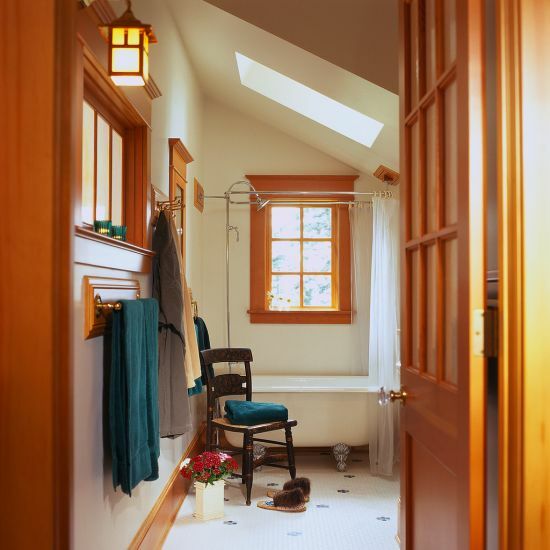 If you want your bathroom to look spacious, try fitting a window or a skylight to allow more sunlight to enter and light up the area. The image below is that of a bath area that has been designed with a skylight and a window for light to come in. In order to add the feel of more space to your small bathroom, you need to spruce up the lighting. Installing dramatic ceiling light fixtures like the one seen below helps in sprucing up the decor and creates the illusion of a bigger space. The ornamental chandelier looks chic and adds glamour to this small bathing area. Open shelves as seen below, add a look of openness to a small area. 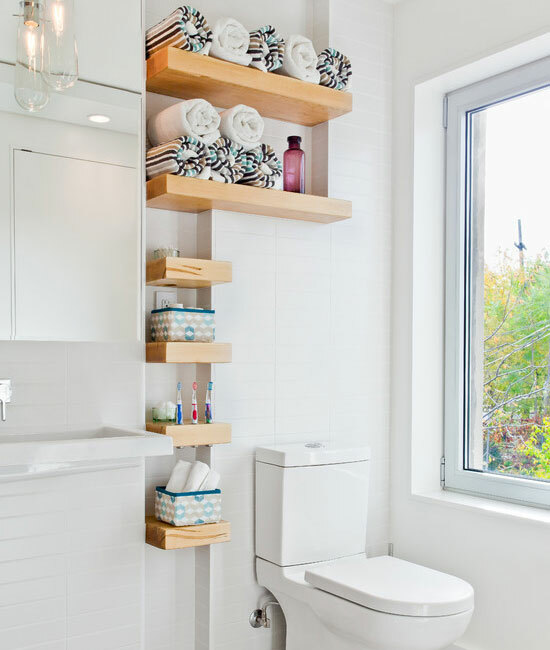 The wooden shelves of varying sizes have been fitted into various nooks of the space above the toilet and help in storing a number of things like towels, bottles and other accessories that we use daily when bathing. Open shelving is one of the most important small bathroom ideas presented today and you must make note of it now. If you want to save some space in your small bathing area, you would have to replace your larger vanity with a smaller one. 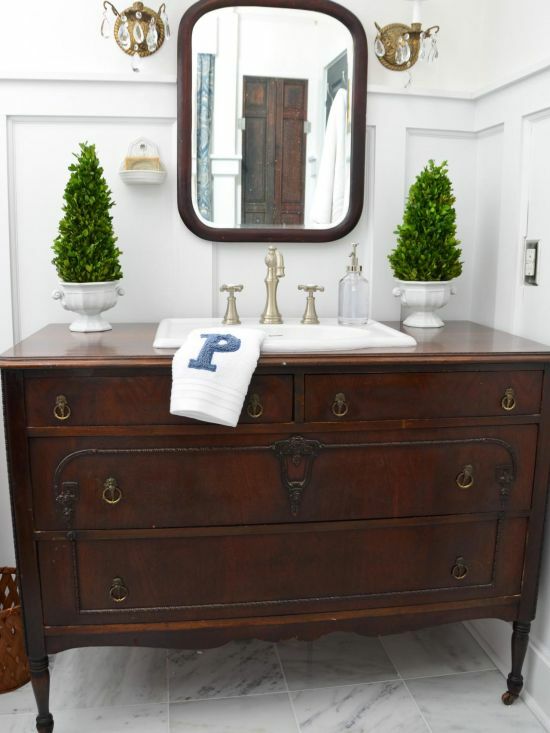 The image seen below is that of a petite vanity with a wooden drawer and inner shelve, plus a sunken sink, white in color. 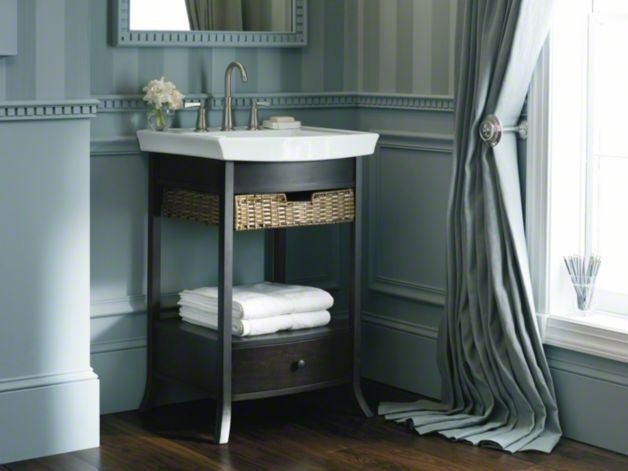 The vanity is small, allowing lots of free space inside the bathroom. 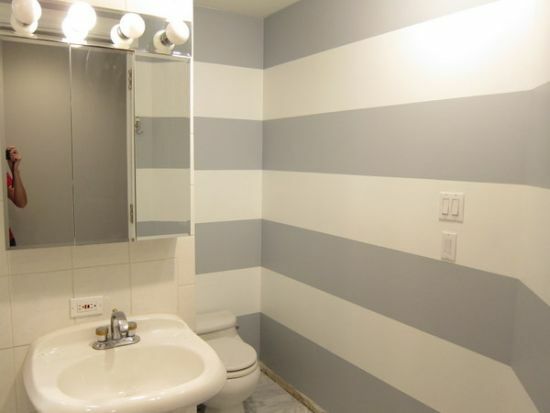 Adding stripes to your bathroom’s walls enhances its look and also makes it look taller or bigger. The bathroom’s walls as you can see in the picture below have been painted with white and grey stripes that make the room look larger than what it actually is. The bathroom below has an open shower area where there is no glass partition or coverings, or curtains to eat more space. Rather, the designer has left the area open to allow it to get more air and light. The sleek shower accessories lend a spacious look to the whole bathing area. 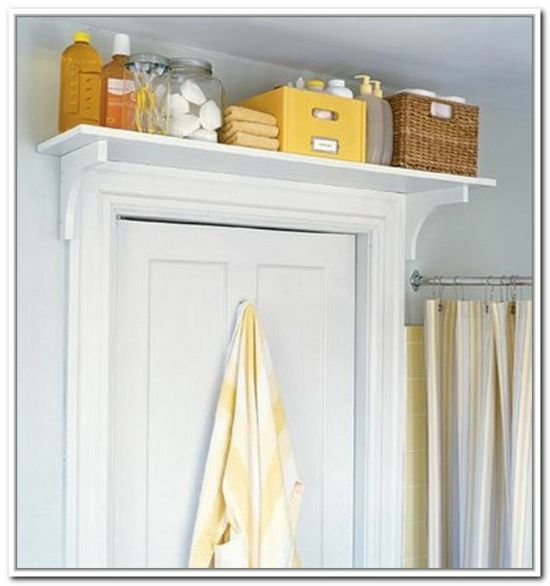 The space above the bathroom door can be utilized to store things instead of cluttering up the bathroom floor. 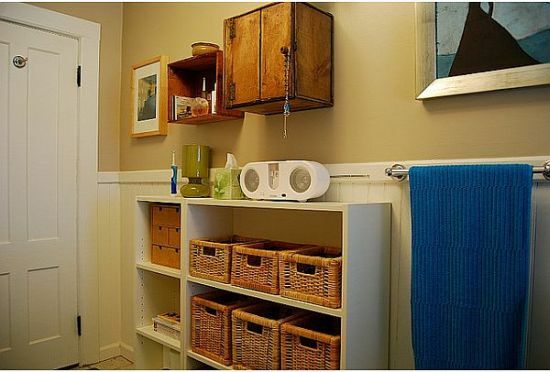 Seen here is an example of a small bathroom where the door has been used to offer storage of things like linen, towels, spray bottles and basket. Doing such a thing frees the floor area and creates a bigger look. If you have a small bathroom, the best way you can add space is to paint its walls using lighter tones like light brown and beige. For such bathing areas that are devoid of natural light, lighter tones of colors add brightness and make the room appear bigger such as the bath area below whose walls and flooring are done up in cream shade. Bold patterns in black and white seen below are one of the most impressive bathroom design ideas that add lot of fun and energy with a bolder take on dimension. The walls below have been decorated or painted with graphic lattice wallpaper that lends an artistic touch to the small bathroom and makes it look spacious instead of cramped up. In order to add the feel of a bigger space in your small bath areas, try fitting a pocket door instead of an usual door. 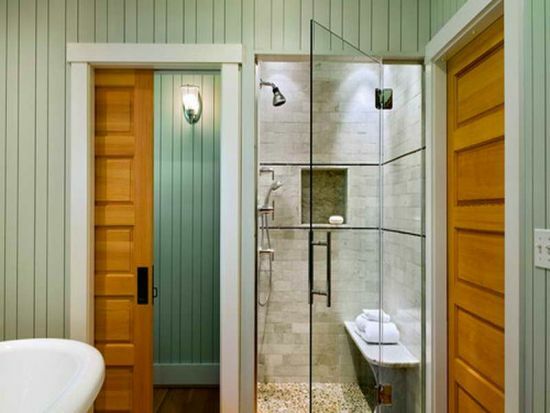 A typical swinging door that opens up inside your bathing area gobbles up quite a portion of space and hence, a pocket door can come to rescue just like the one seen below. It merely slides to one direction and doesn’t eat on space. Small bathrooms like the ones shown today are not just stylish in looks but are quite functional too. 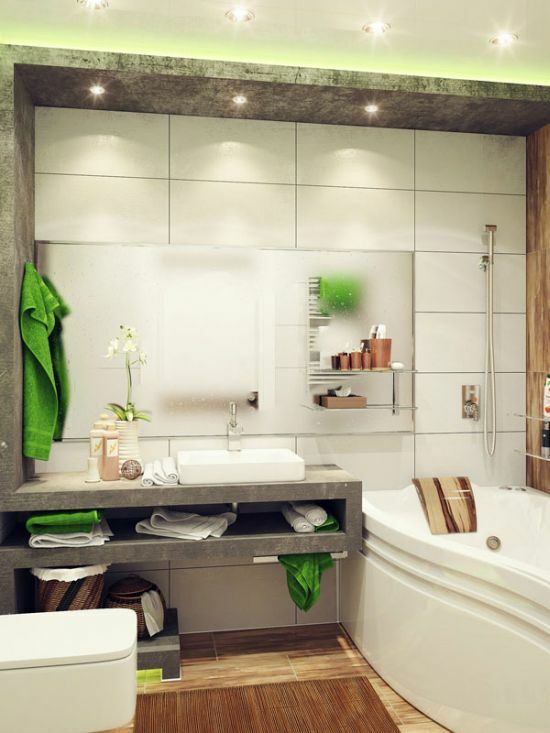 These bath areas have been designed keeping small bathroom designs in mind that utilize features like sunken sinks, flooring shelves and cabinets, focus lighting and every other factor that lends a feel of more space to the tight quarters of small bathing chambers. Do go through these amazing bathroom design ideas and select one whenever you are planning to renovate.